The train line opened in 1850 in order to provide an alternative connection towards Windsor as the existing line via Richmond was already quite busy. The line was also soon used by freight services between the important harbour of Southampton and the Midlands, a connecting line between Kew Bridge and Willesden having been opened in 1853. 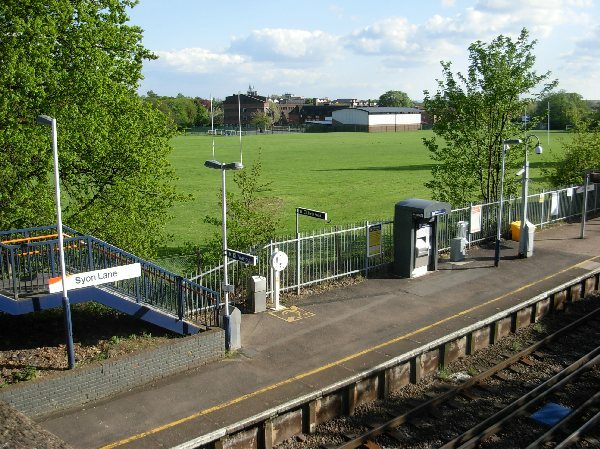 Passenger trains use the line either as an alternative line towards Reading or more frequently as a loop line: trains start at Waterloo, run through Kew Bridge to Richmond and go back to Waterloo. Loop lines serving suburbs from a central terminal are a London specialty (consider the loops through Kingston and through Bexley). I don’t know any examples in Europe even though they are technically possible in Paris, Frankfurt or Berlin. I also don’t see any particular advantage in such loops. Routing note: This walk connects in Kew Bridge with Waterloo walk 3. It connects in Hounslow with walks 6 and 7. The walk passes two museums and two stately houses. My time estimate does not include visiting any of those. If you wish to visit all attractions, check carefully opening times and prices beforehand; if you do visit, you may want to make two walks out of mine using Syon Lane station. The station opened in 1850 together with the train line. 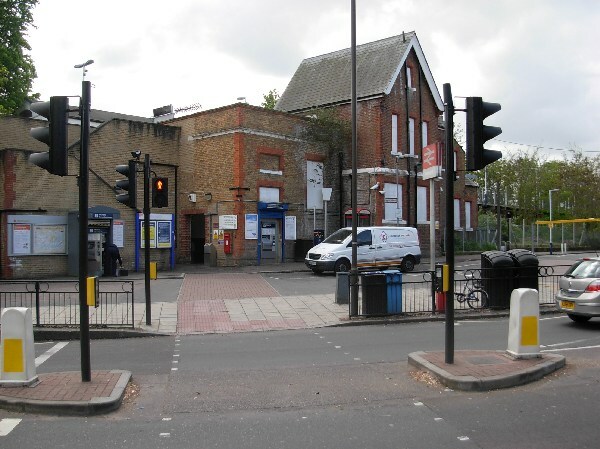 In 1853, a local company opened a junction here in order that trains could run directly between the South-West and North London. This was extremely useful for freight but was less used by passengers. Since 1940, the only services are on the original line. At the time of my picture, the station building had been abandoned. I read that it was renovated in 2013. I think it is the original one, the stone cladding at the corners being typical of stations on this train line. R on the south side of Kew Bridge Road along the Thames (upstream). 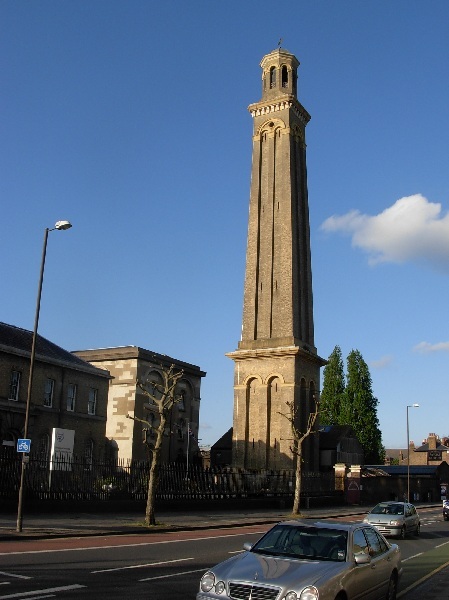 On the other side of the road, the tall chimney relatively close to the train station belongs to the London Museum of Water and Steam, known until 2010 as the Kew Bridge Steam Museum. 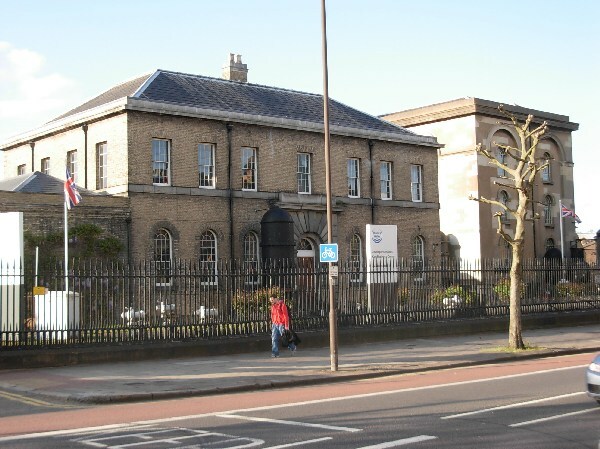 The building was originally a very large pumping station used between 1838 and 1944; the water supplied part of London because the older Chelsea pumps had to be disconnected due to excessive pollution. You can see in the museum some giant steam machinery; as I had visited a similar albeit smaller pump in Tottenham, I decided not to pay the entrance fee (similar to all London attractions, 11,50 £ in 2015).. The buildings are listed monuments, including the chimney which is actually a water tower where water was pumped in pipes in order to gather sufficient pressure for further distribution. 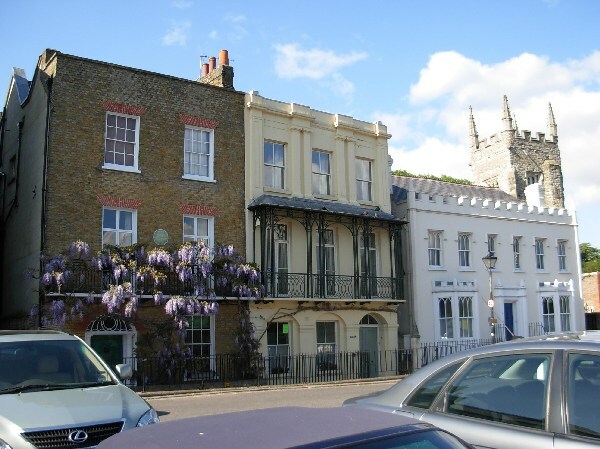 A little further along Kew Bridge Road, you pass the Musical Museum, a private collection of self-playing instruments. I have seen a similar museum in France and it was very enjoyable, but you need to be aware that the museum in Kew has very restricted opening times as you need a tour guide to demonstrate the instruments. Entry is 10 £ but this may be worth it as the ticket is valid for one year and such museums are often fun enough to go several times. On reaching Waterman Park, go down the stairs into the park and follow the Thames Path signs upstream. They lead close to the river except for a short interruption. 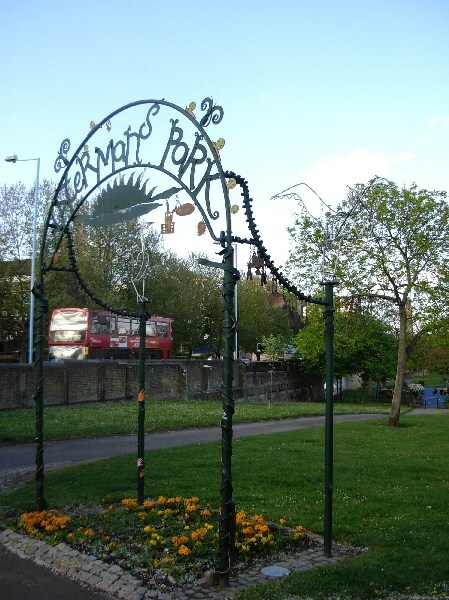 The park is a rather narrow strip of land between the busy road and a row of house boats, but it is quieter than the roadside and it has a few flower beds. 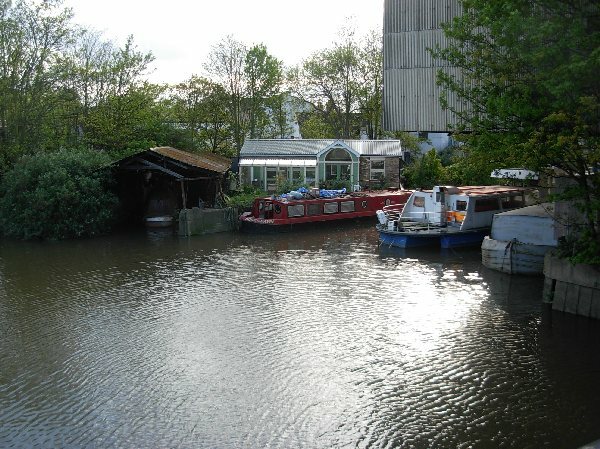 The borough has been discussing whether to replace the house boats with a more profitable marina, part of the park being then lost to a parking and storage area. 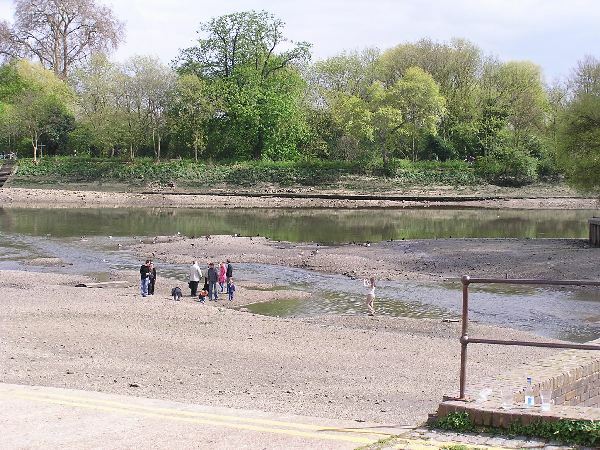 Waterman Park looks out to an island in the middle of the river, Brentford Ait. 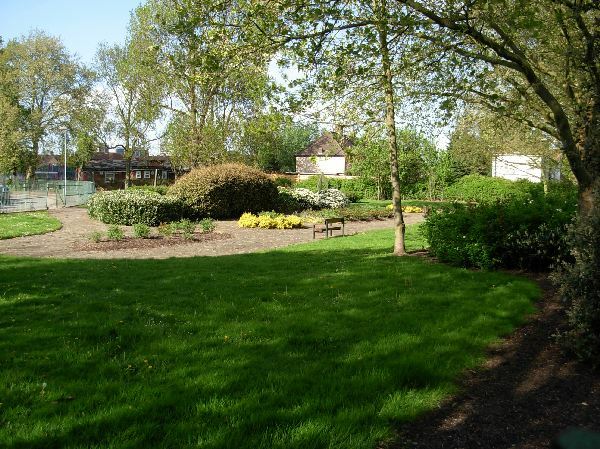 It has an air of wilderness and is indeed a nature reserve nowadays but the planting was actually artificial and was done in order to improve the view from the royal property of Kew Palace as the park was just opposite industrial premises. From the park, you can also see what looks like a church. This was indeed built as St George’s church in 1887. 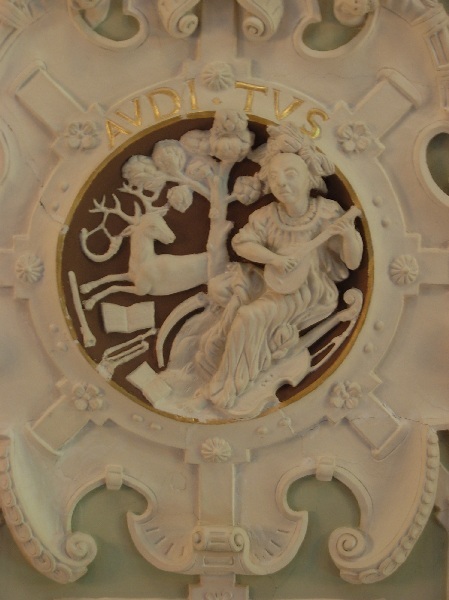 It was then used by the Musical Museum and the borough has allowed a speculator in 2009 to convert it to luxury flats. 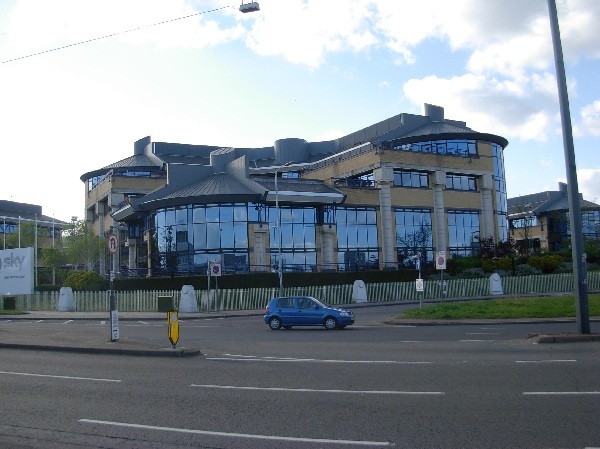 It is considered inappropriate to convert catholic churches to commercial premises or private flats, but other Christian denominations have no issues with this. Towards the end of the park, you pass a somewhat inconspicuous cultural centre, the Watermans Arts Centre. If the time of the day is appropriate, you might be lucky and see an interesting exhibition. The centre is particularly keen on showing digital and modern media art. A developper has offered to rehouse the arts centre in an other building nearby as the riverside acreage would be very profitable to turn into other uses than an arts centre. 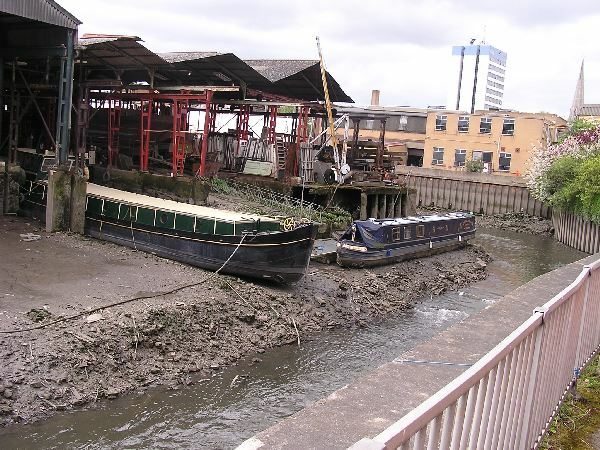 The path then leaves the Thames for the river Brent passing a recent development at Ferry Wharf. The flats are very expensive considering the rather uninspired architecture but the location is obviously very nice. 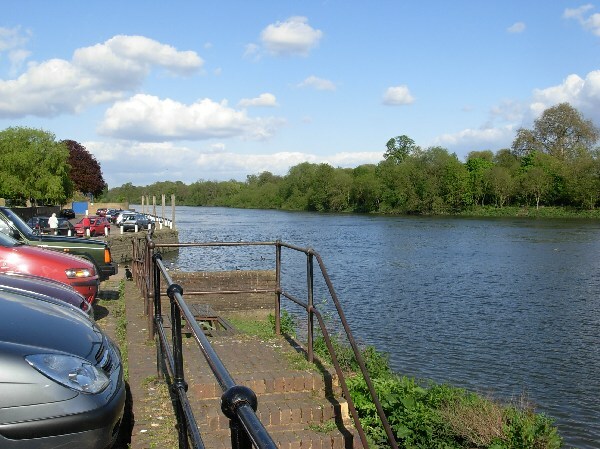 The Thames path follows the river Brent upstream, crossing it at a road bridge and again later on a footbridge. 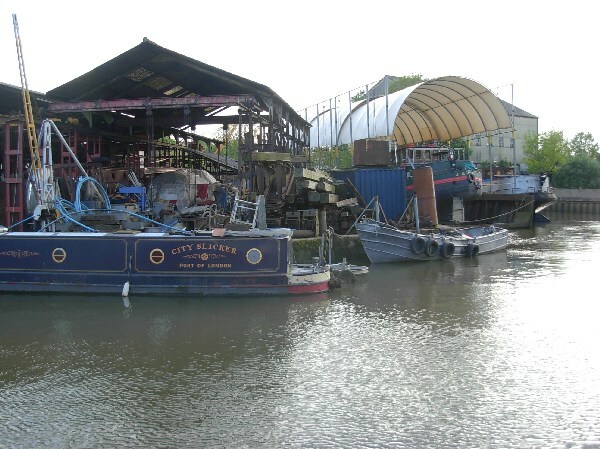 The area around the lock is a picturesque reminder of traditional Thames industry, a busy boat yard. There are very few yards left in London. It is also one of the very few industrial premises that look interesting, as opposed to modern factory quays. 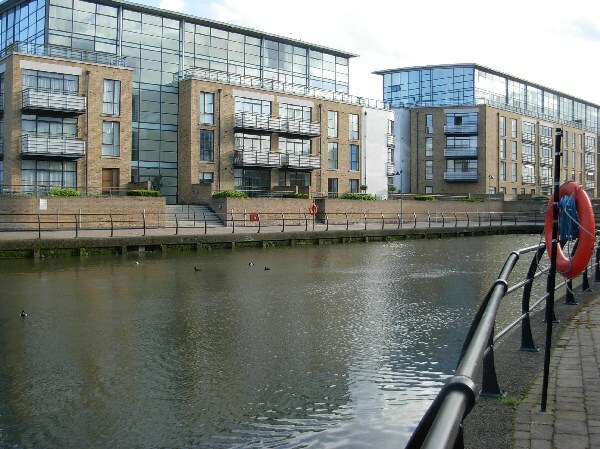 After Thames Lock, the river Brent looks much quieter and more residential. 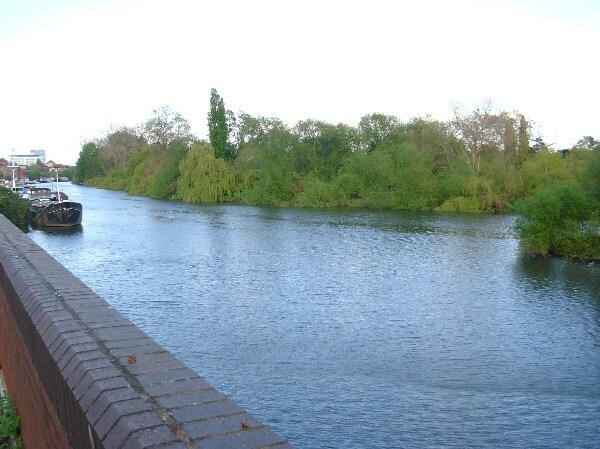 Despite being indeed a river, it is actually used as the main canal linking the Thames with the Midlands. 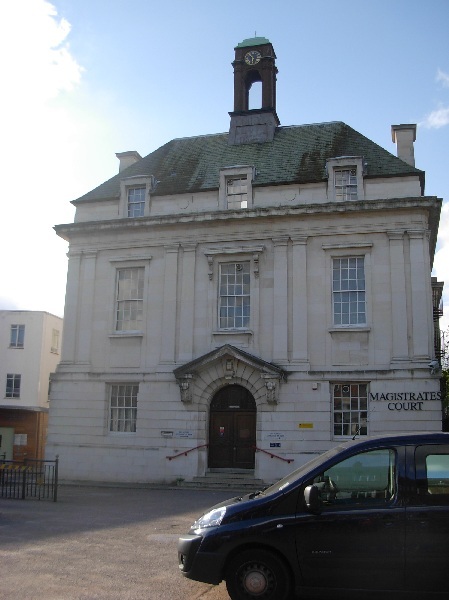 The stately building on High Road at the level of Market Place was the Magistrates Court from 1859 until 2012. It was built by local speculators with the intention of selling it to the borough as the new Town Hall, but the sale did not go through. 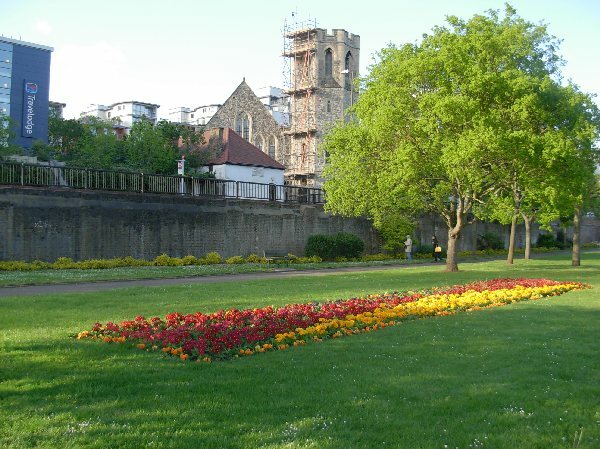 As it is not a listed monument but is protected by a conservation area, it will probably be developped as luxury flats and possibly a restaurant. This is a historical place. 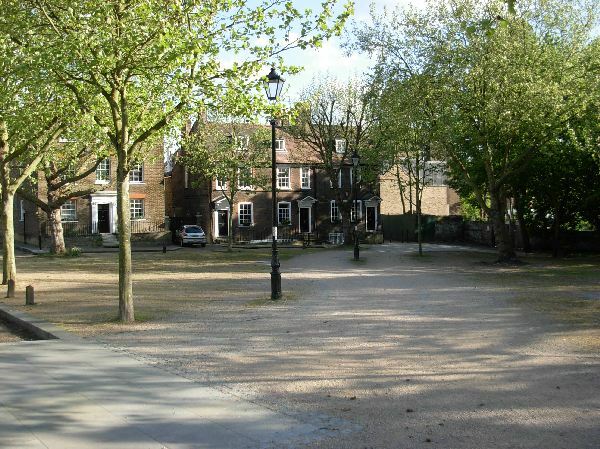 Until 1841, elections for the Members of Parliaments for the County of Middlesex did not take place in Westminster, the official seat of the county, but on The Butts in Brentford. As you can realise, elections were not exactly with secret ballots and this may explain why some electors were so susceptible to pressure after having received some presents, if necessary in terms of strong beverages. The Butts are a delightful square with trees and many Georgian houses. 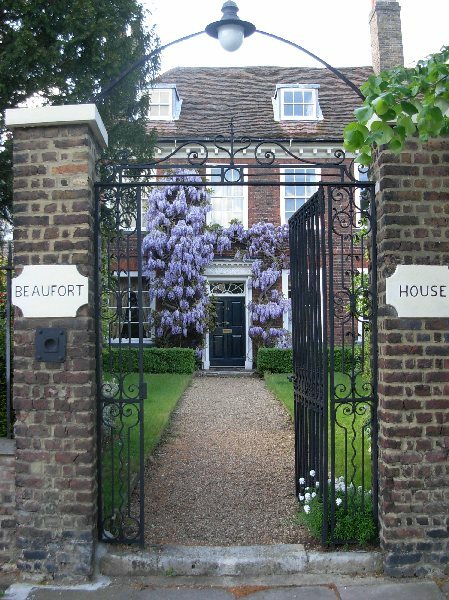 Beaufort House on my picture is one of several examples, I liked it because of the flowers. The stately brick building with somewhat amusing baroque details is the town library. It is one of the many public libraries built around 1900 (here in 1903) in a typically Edwardian style with funds provided in part by the Andrew Carnegie foundation. Originally, the land was part of the park of an 18th century mansion that was demolished in the 1950s. 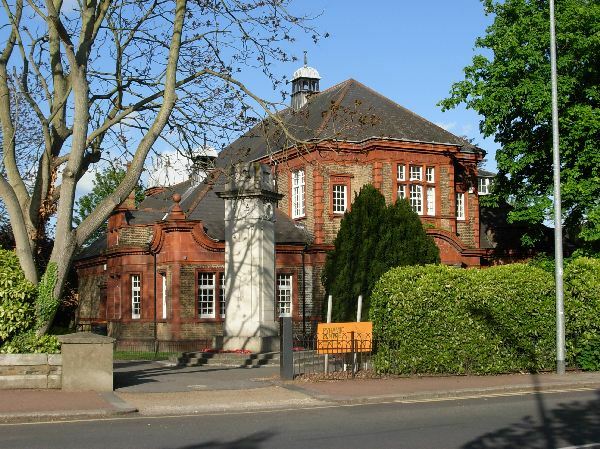 The architecture combines a lot of disorderly decorative details, as you will notice if you read the description given on a local history website that needs no less than about 50 lines of text (http://www.brentfordhistory.com/2014/01/02/brentford-library/). The website is excellent on many local landmarks. 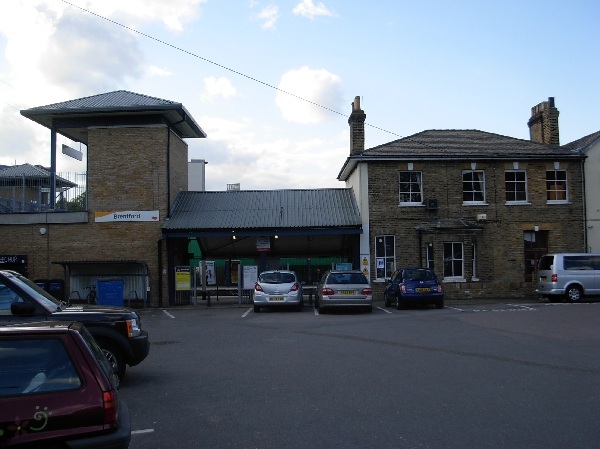 The station was opened together with the train line in 1849. It was called Brentford Central between 1950 and 1980. The station building is in part the original one and the windows remind of those of Chiswick station, the nicest on this train line. The rather imposing tower on the left of the picture gives access to the footbridge over the tracks; it is unusually imposing because it was financed by a large corporation when they opened their headquarters in the vicinity. Ahead across the major road and underneath a motorway, still on Boston Manor Road. At the start of this road on the corner with the dual carriageway, you passed the towering headquarters of a large pharmaceutical company. Like many multinational corporations, it results from the merger of many individual companies and it could have been named Glaxo Wellcome Smith Kline Beecham. The size of the headquarters gives an idea of the size of the company; from the look of them, they were probably built between the merger in 2000 and the 2008 recession. 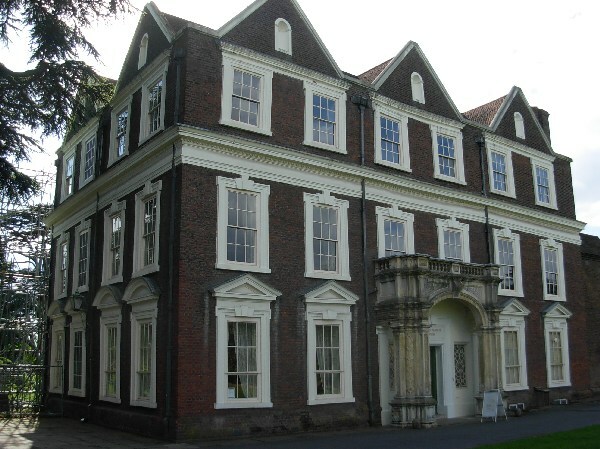 This mansion is one of the very few remaining Jacobean manors remaining in London along with Charlton House. The building was partly damaged during World War II and used as a school for a few years afterwards, but some original features had been preserved and were renovated over time after the building became a museum in 1963. It belongs to the Borough since 1923. The architecture is rather simple as it is just a rectangular box, all the care going to the conspicuous cornices, pediments and window sills. The present entrance porch is not original as Jacobean houses normally had the main entrance towards the garden. The porch is probably Elizabethan and must have been salvaged from elsewhere by the owner who moved the entrance to the road. The property is only opened on weekends from April to October, but is well worth visiting if you can time your walk accordingly. There is no entrance fee. You can only visit a few rooms, but at least two of those are really interesting. 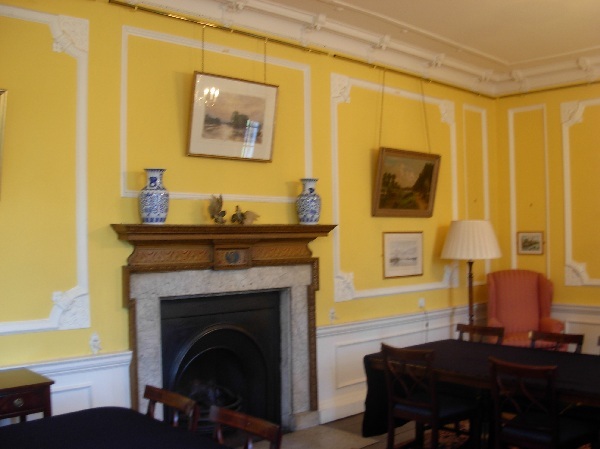 The ground floor parlour is delightful, the yellow colour being quite expensive and fashionable in the 18th century. Their Majesties had refreshments in this room once at the beginning of the 19th century, a very daring move and a resounding achievement for the property owners who were from a very ancient family but were commoners and therefore normally excluded from Royal visits. The staircase is grand and shows the very conspicuous decoration that was in fashion in the 17th century: opposing colours, coats of arms, heraldic animals (actually more in fashion in the previous century), strong volumes. I apologise for my picture being bad quality. The main attraction is the grand parlour on the first floor, often used in period films. 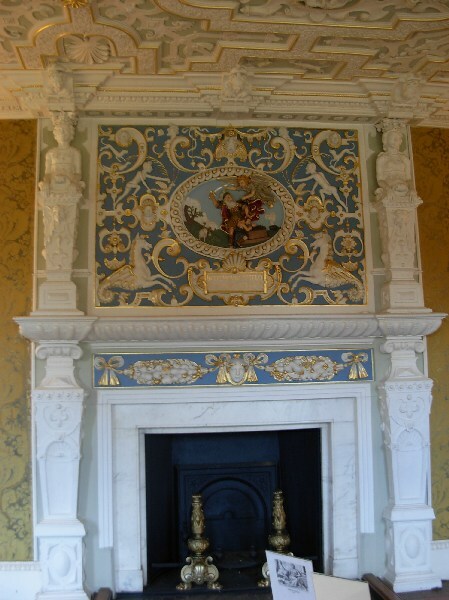 The wallpaper is a reconstitution, but the huge chimney is indeed typical of Jacobean fashion. The decoration above the mantlepiece is typically Renaissance, a style that had been ubiquitous in France 50 years earlier. 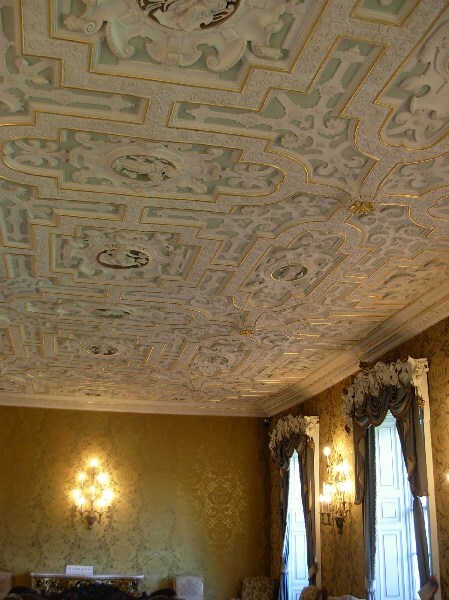 The ceiling is a magnificent stucco masterpiece with a series of medallions showing the five senses. After visiting inside, you can have a walk in the park, actually little more than a sloping lawn with a few large trees. 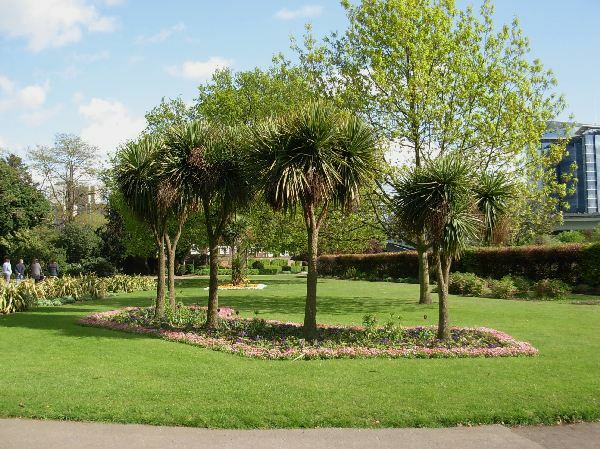 The most interesting section is along Boston Manor Road with flower beds under beech and palm trees, accurate hedges and other manicured planting. Go back to Boston Manor Road passing under the motorway. The road crosses a canal. 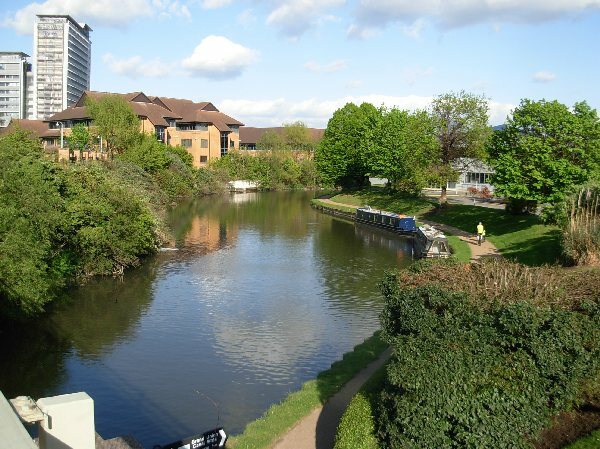 Grand Union Canal was an essential link between London and Birmingham built in the 1790s to enable boats to avoid the upper Thames between Oxford and Reading, where water conditions were unreliable. Competition intensified when a railway opened on the same route in 1839 but the canal remained reasonably well used until the 1950s as it could afford to lower fees, the infrastructure having been paid. I don’t normally suggest walking along a dual carriageway, but this makes sense in this particular instance because it enables you to pass several remarkable industrial premises in purest Art Deco style. This stretch of the A4 was actually called the Golden Mile in the 1930s. At number 991, you can see a former factory for electrical appliances now used by Decaux, a company selling urban furniture such as bus shelters. 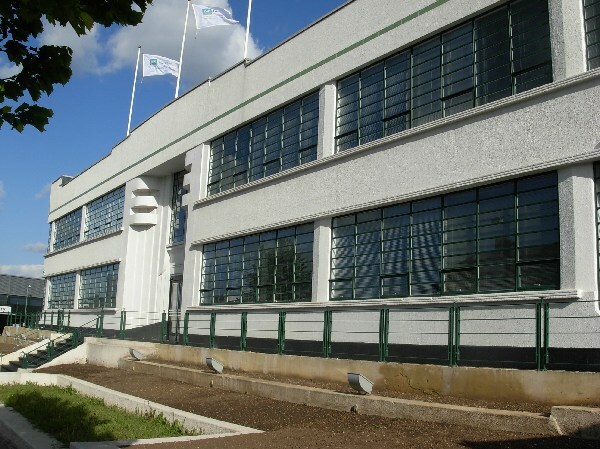 You can note the very clear horizontal and vertical lines, the rounded ends reminiscent of ships, the high number of large windows and the total absence of decorative clutter, all being typical of Art Deco. 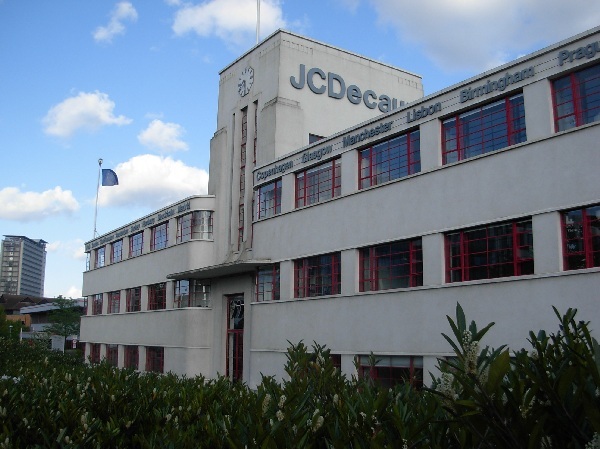 Number 981 was a factory for fire extinguishers and was designed by the most prominent British Art Deco architects, Wallis, Gilbert & Partners. It does not have the steamship-style rounded ends, but it boasts an elegant entrance with complementary colours (red and green), an other typical design. The staircase design at the corners of the entrance tower is called a ziggurat shape and was very popular. Number 941 was a cosmetics factory and is very comparable to number 991, but even more horizontal. 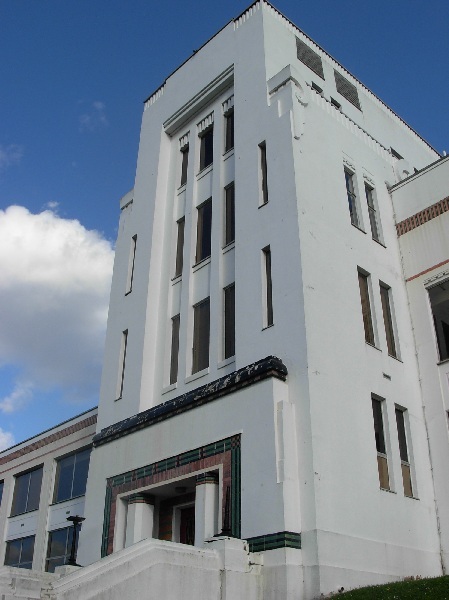 There was also a number of additional art deco factory buildings further along the road, but most were demolished over time as industrial premises were not considered worthy of being listed as protected monuments until very recently. 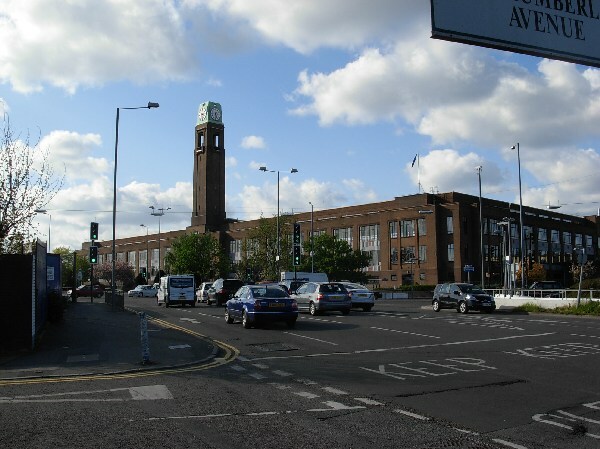 At the corner with Syon Lane, the huge brick complex on the opposite side of the main road is a former cigarette factory. It is Art Deco, but more in the Dutch than in the Italian tradition of this style. Very large windows were just as conspicuous (and fitted with the general opinion at the time that it was very important to have as much sunlight as possible, even though Britain did not go as far as Germany where there was a major fad for nudism at the time). But Dutch Art Deco replaces conspicuous entrances with towers and there are no curved sections as this was inconvenient with bricks. 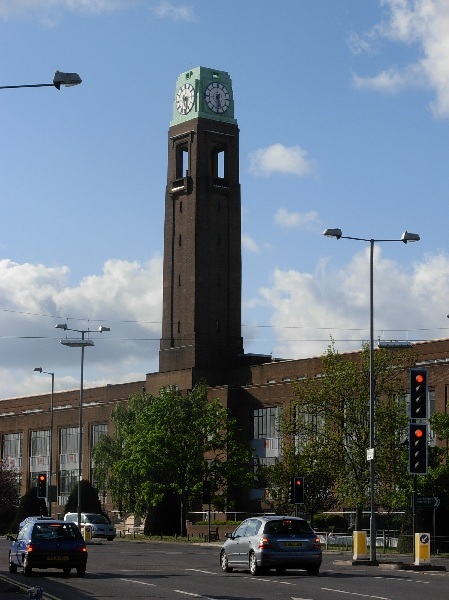 The building is conspicuous for its size, but is actually not the best example of Dutch-inspired Art Deco in London (the Greenwich and Barking town halls are more convincing). 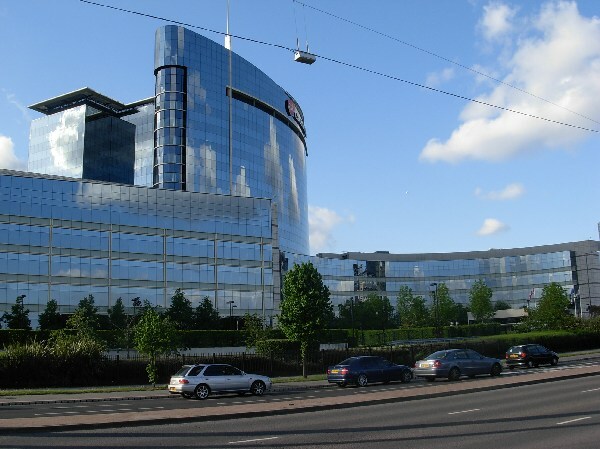 The cigarette company moved production to Poland in 2006 and the building was sold to a developper expected to turn it into commercial offices. The station was opened in 1931 because of large industrial developments in the vicinity that made easy access for commuters necessary. 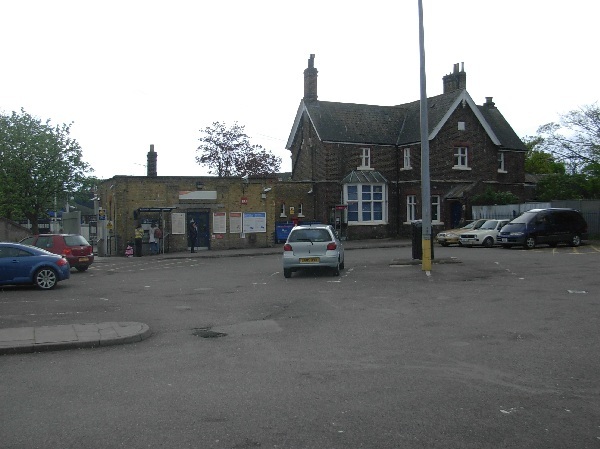 Because it did not serve a neighbourhood, the train company just built two platforms with no station building. 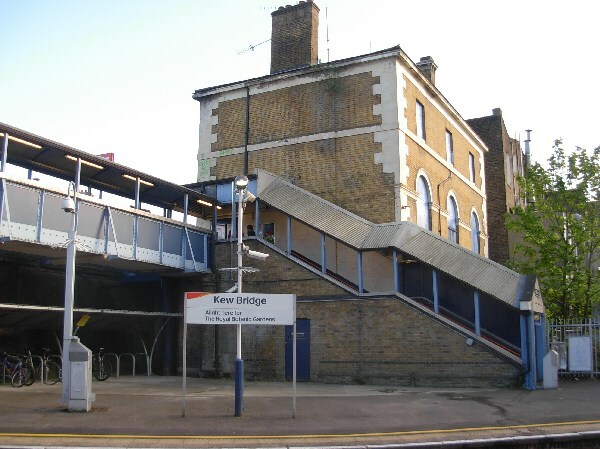 No footbridge was built as control through a single ticket office was not seen as necessary, travellers therefore using the existing road bridge. 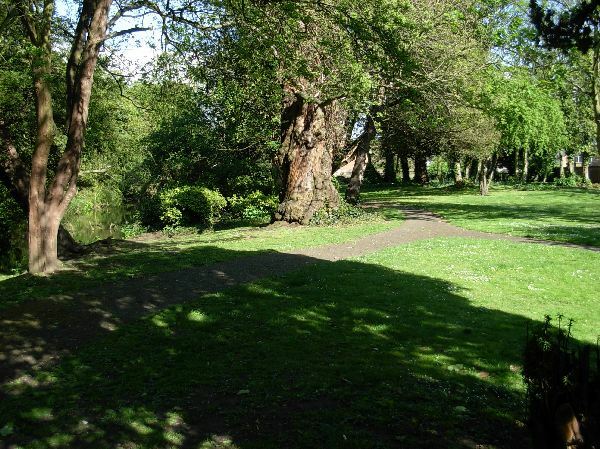 There is a pleasant green space along Syon Lane just after the bridge over the tracks. It actually uses a small part of neighboring playing fields, those having to remain fenced. 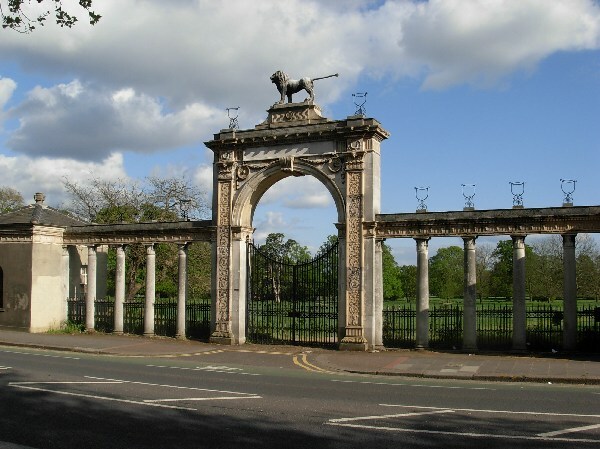 You pass the magnificent entrance gate to the Duke of Northumberland Estate, a private property. The grand portico is crowned by a lion with a very weird straight tail that looks like the animal sat on some sort of broom. The design is by Robert Adam, who had planned real stone urns instead of the iron outlines and a normal lion tail instead of a broom handle. I guess something happened. The gate is never opened because the green space behind it is the private park of the Duke of Northumberland. 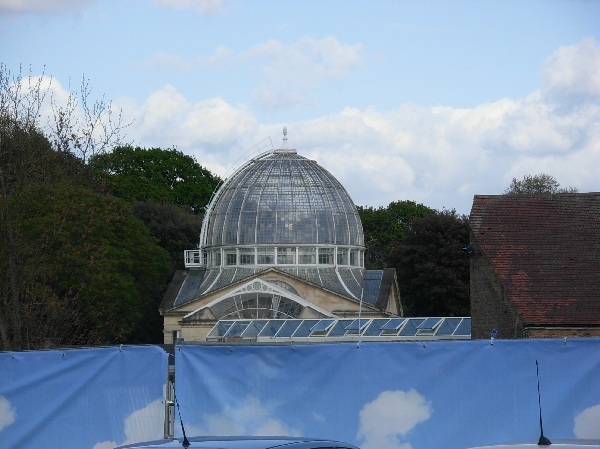 This was used at a time as the surroundings for a butterfly house meant as an attraction for families, but this was closed when the Duke envisaged allowing a luxury hotel to be built in part of the grounds. In the end, nothing was built. From this access road, you do not see much of the park but you can visit a shop selling plants and you get a glimpse of the conservatory. It was a technical landmark when it was built in 1826 because it was the first to be built out of gunmetal, a bronze alloy more commonly used for cannons. This material was superseded a few years later by steel. You get a picture of the building seen from the gardens although I did not visit them as I took advantage of repairs to the wall that had left an opening for the view. You can visit the park in summer for a fee. 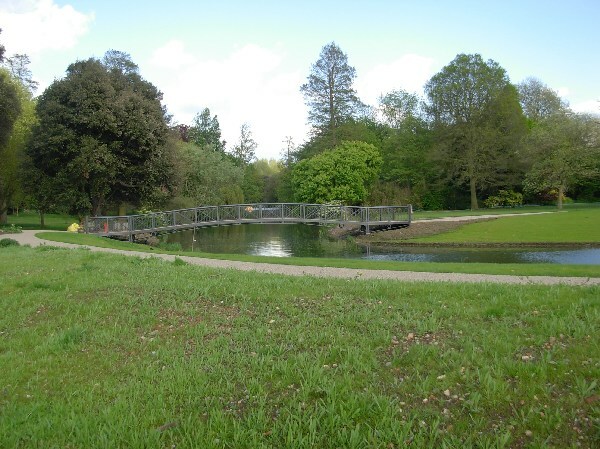 It was landscaped by Capability Brown in the 18th century, boasts many large trees and also includes flood meadows that are an important nature reserve. I did not visit the park and I cannot give you pictures. 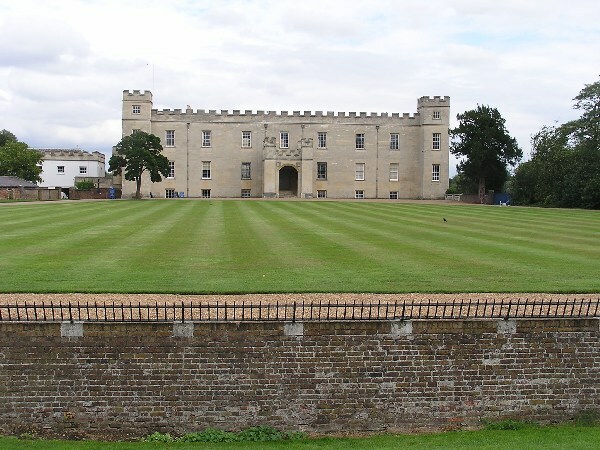 After leaving the parking area, you soon get a view of Syon House as the wall is replaced here by a ha-ha, the ditch used in large properties to separate the outer park where deer were encouraged from the inner park where flowers had to be protected. Legend says the name ha-ha comes from the heir to the French throne being shown around Meudon palace around 1700 and being surprised at the gardening device. In French, you actually call this a “saut-de-loup” or “wolf’s leap”. 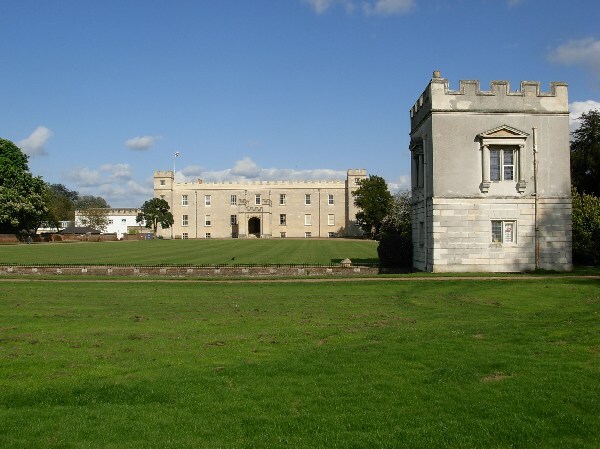 Syon House strikes me as being a particularly forbidding mansion. The outer appearance dates back to construction in 1547 and is therefore interesting to compare to Hampton Court palace which is from about the same period. I have never visited the mansion because I did not expect it to be very different from properties I could visit for less as a member of the National Trust. 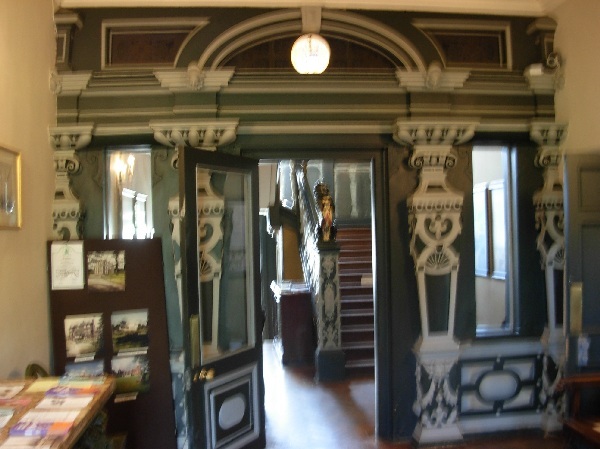 The mansion is particularly well known for a number of rooms decorated by leading architect Robert Adam, for whom it was the first major commission. 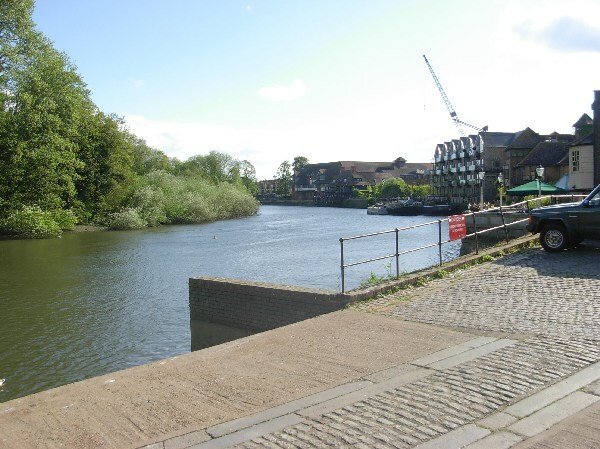 You are now on the riverside in Isleworth, a particularly delightful corner looking downstream. 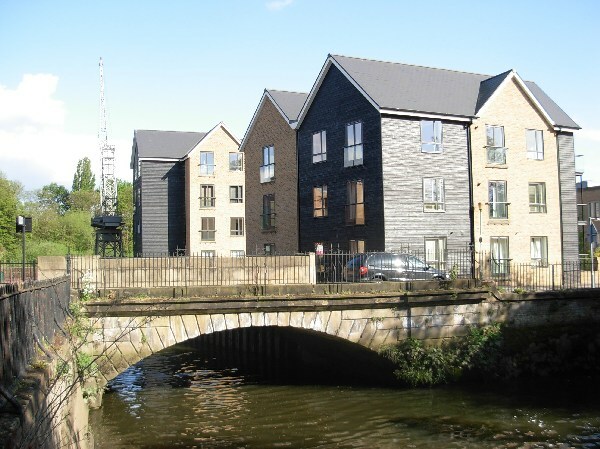 It is less attractive looking upstream due to converted industrial premises. You can have a look at All Saints Church, a rare riverside church as this implies it was not in the centre of the village. 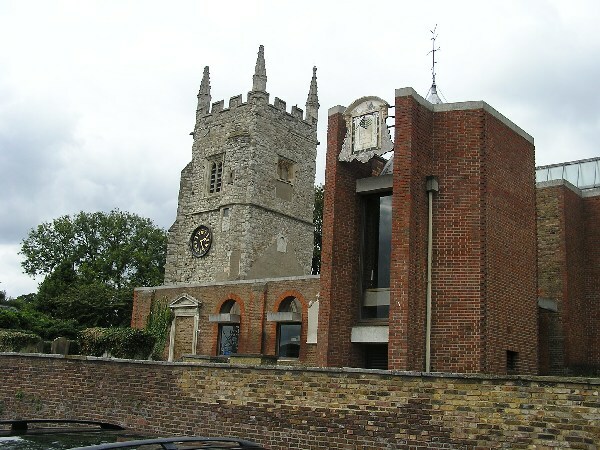 The original church was burnt down by schoolboys in 1943 (who also committed arson in nearby Hounslow and were possibly inspired by reports on big fires in the City of London after bombings). 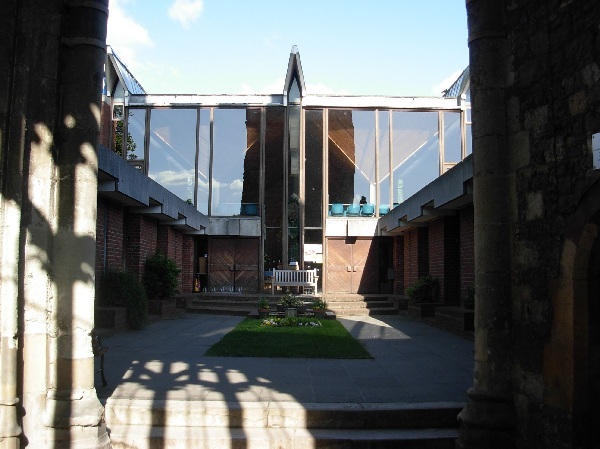 The tower is the original 14th century section while the nave was rebuilt in 1970 in a modern style. I was unable to enter the church but the courtyard is enough to give an interesting glimpse. Just after the church, you pass a row of three beautiful old houses illustrating three very different periods. The first one is a mock-gothic building in a style very fashionable around 1820. The second one is a dignified neo-classical villa in typical cream painting and the third one is a typical Georgian house with the roof hidden by a cornice and a nice original door. 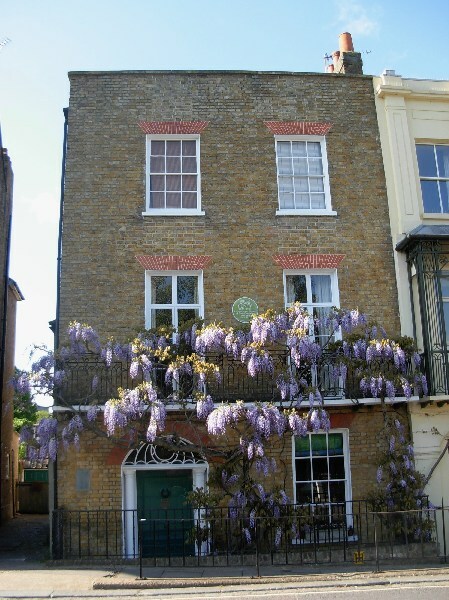 Georgian bricks often look awfully dark and it is fortunate that the owner cares for a wisteria vine. After the riverside pub, you reach a bridge near the weir over a small river. I noted a rather nice development here. It respects the size of the previous mill and half of the buildings are clad in dark wood, which automatically breaks the somewhat dreary appearance of concrete. 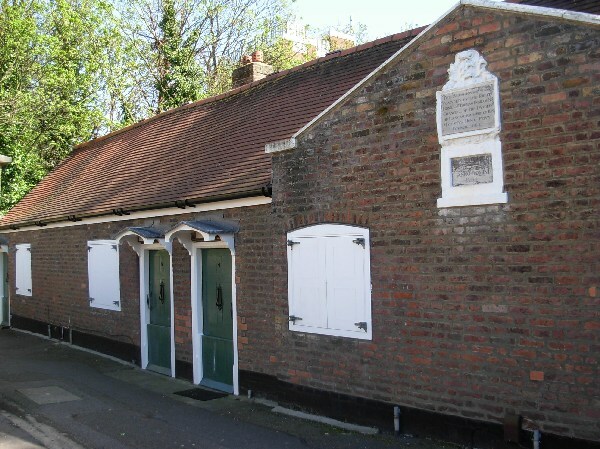 Along the passage, you pass a long, low building called Ingram’s Almshouses. They were built in 1664 on the basis of a bequest and are still owned by the local housing charity. You continue later on through a very pleasant green space along the small river. 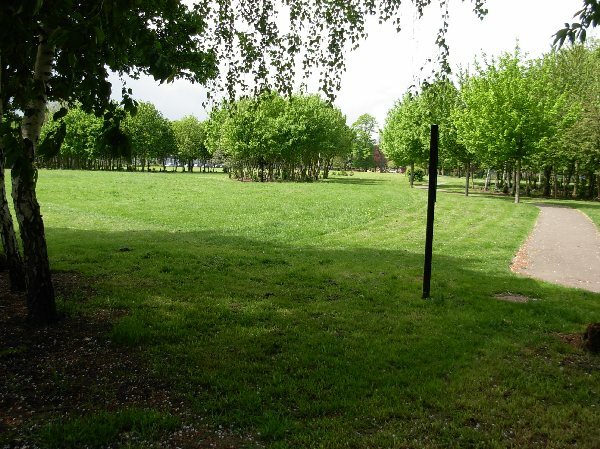 This is a neighbourhood park with the usual lawn, a few trees and a children’s playground. 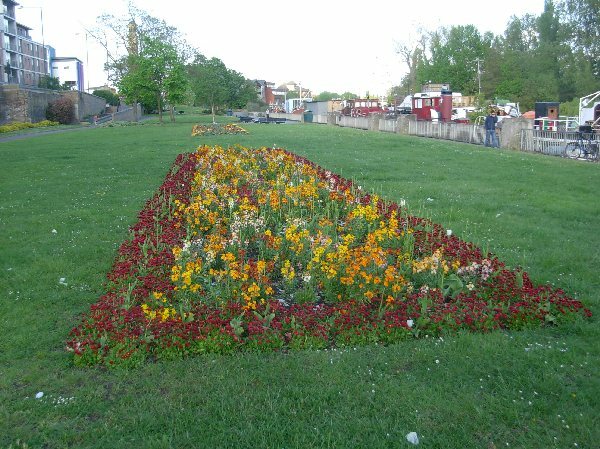 There are only very small flower beds. The station opened a few months after the train line in 1850 due to construction delays. 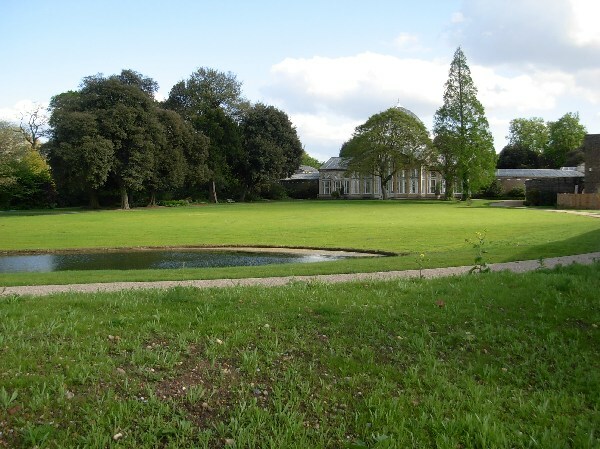 It was renamed Spring Grove & Isleworth as early as 1855 as it was closer to the first location than to the second. The name was simplified back to the original Isleworth in 1911. The station buildings are a rather strange mix. I don’t think that they are as old as the train line because they are lined with red bricks, an Edwardian rather than Victorian feature. Also, the windows are very plain. Despite the harmonised façade, the buildings look strange because the central section has an extremely steep pointed roof while the left-side section has a flat roof. Most of the building is abandoned with trees growing through the roof. The staircase at the very left of the picture looks unusually massive at it had to be squeezed into a limited space. 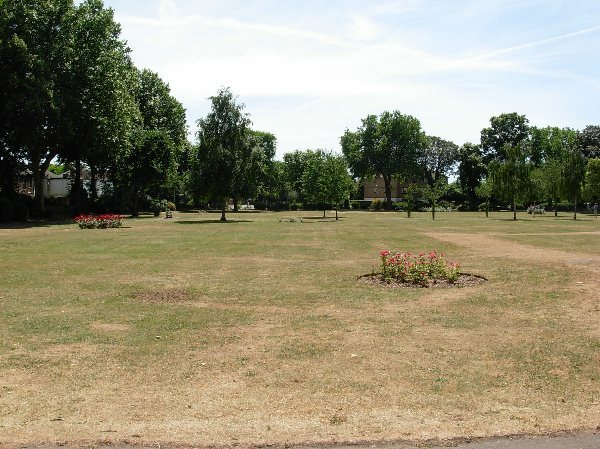 The park was the first park the borough developped in this area back in 1902. 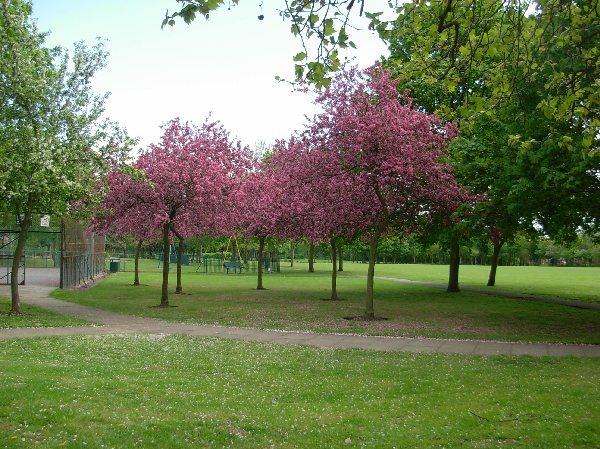 Hounslow is densely populated and has few large green spaces. Inwood Park has some formal planting at one end, but I happened to visit between seasons when it was not planted. The rest of the park is a pleasant lawn with many smaller trees. Note a very nice Art Deco house in this road. It has the same features than the factories you saw in Brentford, in particular a focus on horizontal lines, a large number of windows and rounded shapes reminiscent of a steamship. 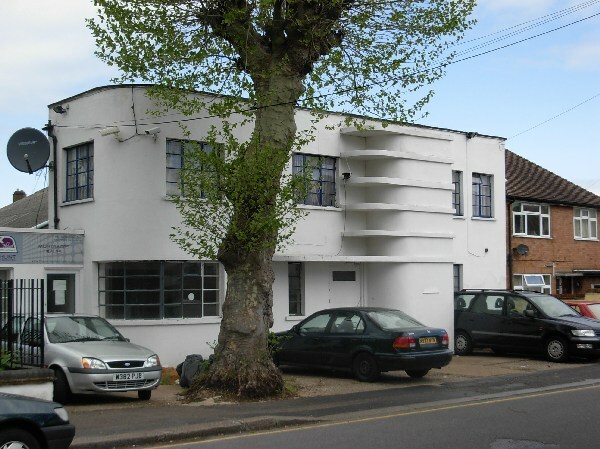 Art Deco houses are nearly always painted in stark white as architects tried to avoid distracting decoration. The station was opened a few months after the train line in 1850. The building gives a good feeling of how rural the area was at the time. It is obviously the original one and looks like a large cottage. It is not used by the railway any more and I am not sure whether it has been leased or renovated in any way to enable new use. The ticket office is now housed in a nondescript brick shed, as in Chiswick.